STUDENTS, WE WILL BE REVEIWING FOR THE SOCIAL STUDIES MILESTONES THE WEEK YOU RETURN FROM SPRING BREAK….. HOWEVER…..I HAVE A SPECIAL ANNOUNCEMENT FOR YOU…. 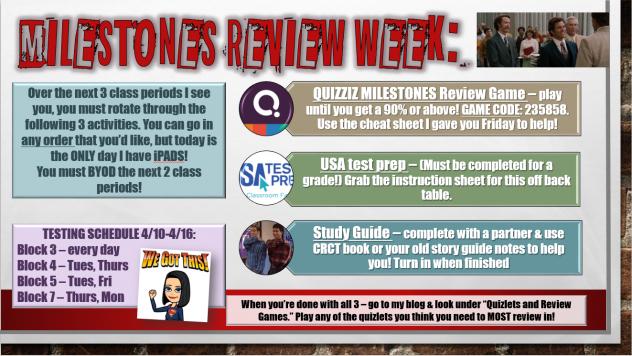 Use the study guide and/or PPT below as a reference to complete QUIZZIZ MILESTONES REVIEW GAME (link and game code below). You can play as many times as you’d like until you get an A on the quizziz. That will give you an automatic 100% on the Final Exam, without even having to take it! You’re welcome! Remember to enter your FULL NAME when playing the Quizziz. MUST BE COMPLETED BY MONDAY 4/16! For all station instructions and resources, look under Office 365 but clicking on the bit.ly link under “Unit Reources” at the top of this page. 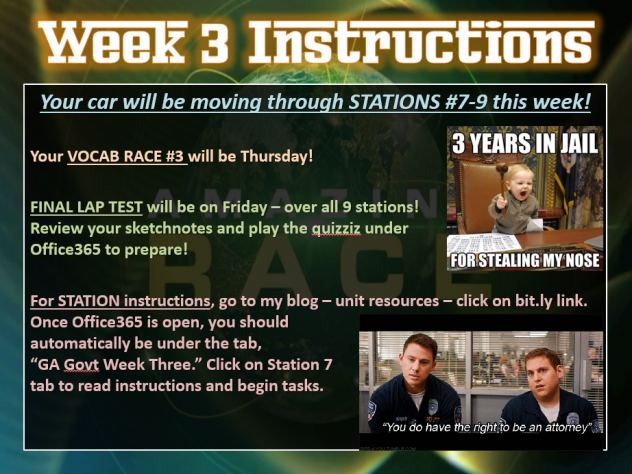 FINAL LAP TEST WILL BE FRIDAY OVER ALL STATIONS – THE REVIEW GAME FOR IT WILL BE UNDER OFFICE 365! 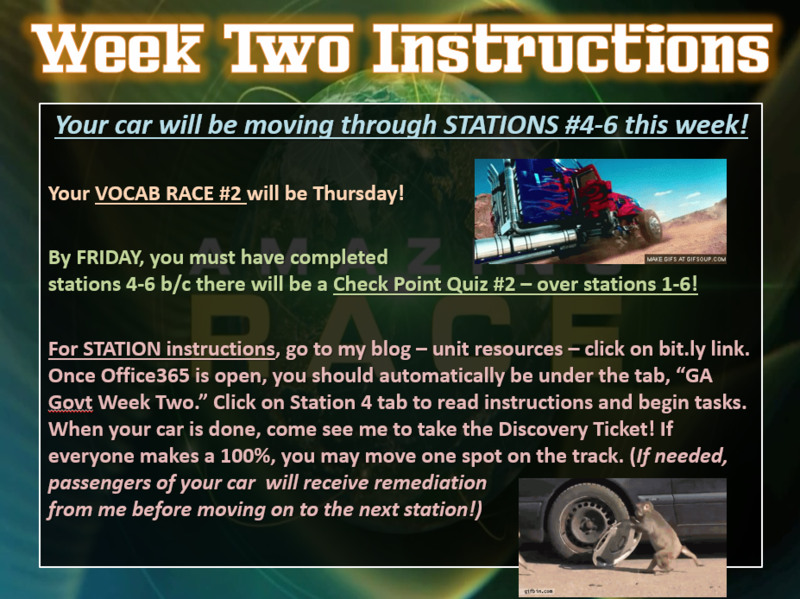 CHECK POINT QUIZ #2 (over stations 1-6) IS FRIDAY, 3/23! Reminders…..Quiz over Stations 1-3 will be at the end of class FRIDAY! WEEK ONE QUIZ REVIEW GAME IS UNDER UNIT RESOURCES! HW: complete guided questions – DUE MONDAY! 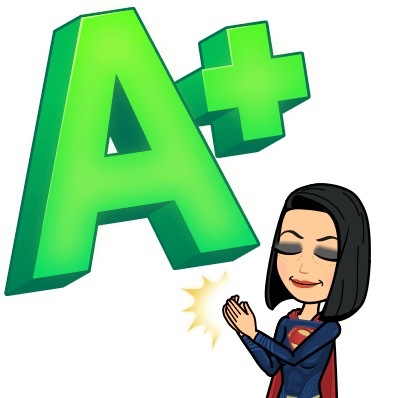 Return yesterday’s graded test – y’all did GREAT! HW: cont. 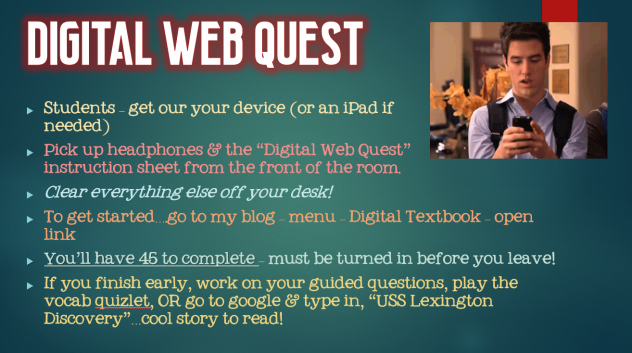 work on guided questions using your teacher notes & study vocab! NO HMWK! 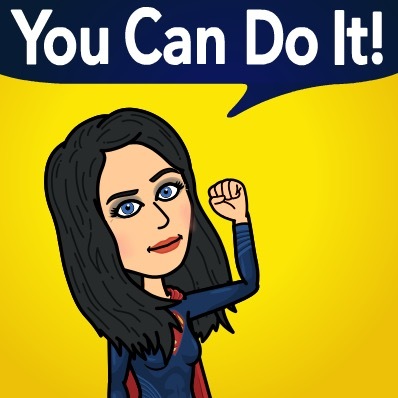 Reading Counts Quiz due date – 3/14! HW: work on guided questions and study vocab! Vocab Quiz – FRIDAY 3/9! 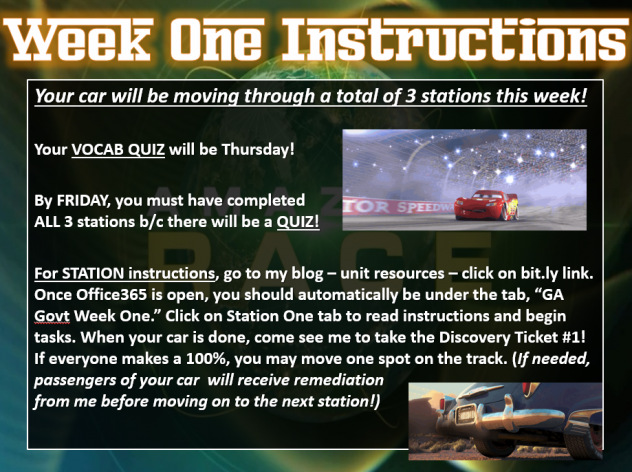 Guided Questions Due – MONDAY 3/12! NO HMWK! Reading Counts Quiz – 3/14! Warm-Up: read Teacher Notes section, “Georgia during WWII” and complete story guide #s 36-40. SUPERSKEANS HERE TO LET YOU KNOW THAT MRS. SKEANS PLANS ON ASKING 4 QUESTIONS FROM THE PREVIOUS UNIT ON TMRRW’S TEST. YOU WANT TO KNOW WHAT HEY ARE, DON’T YOU????? ALRIGHT – YOU NEED TO KNOW WHO TOM WATSON WAS! ALSO, BE ABLE TO TELL ME THE PURPOSE OF THE ATLANTA INTERNATIONAL COTTON EXPO, THE NAME OF THE CIVIL RIGHTS LEADERS WHO BELIEVED IN JOB SKILL EDUCATION AND GAVE THE ATLANTA COMPROMISE SPEECH, AND HOW WASHINGTON’S APPROACH TO CIVIL RIGHTS WAS DIFFERENT FROM DUBOIS. ONE MORE THING….IF YOU MISSED THE EXTRA CREDIT OPPORTUNITY THAT MRS. SKEANS GAVE LAST WEEK, SHE’S OFFERING A SECOND ONE. YOU CAN WATCH THE 2ND WORLD WARS EPISODE – A RISING THREAT – AND ANSWER THE QUESTIONS THAT GO WITH IT. TURN IN TMRRW WITH A PARENT SIGNATURE! GO TO UNIT RESOURCES TO FIND THE LINK AND QUESTIONS!